Founded at the beginning of the year 2005 upstairs berlin gallery is located in central Berlin. The gallery is in the gallery building on Zimmerstrasse 90/91, staircase A 2, 1st floor. Upstairs berlin’s program concentrates on international contemporary art. 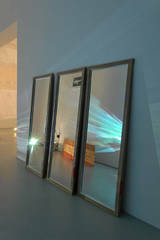 Its main focus is on young European artists working in a wide range of media. Promoting the long-term development of artistic careers the gallery's aim is to discover and establish new talents. The gallery is run by its co-founders Harriet Häußler and Aeneas Bastian.